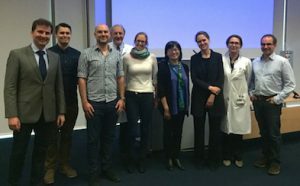 Prof. Angela Krackhardt and Prof. Markus Schwaiger organized a translational research meeting at the Technical University of Munich/Klinikum rechts der Isar to advance state-of-the-art in vivo imaging techniques for visualizing immune cell responses in patients. Prof. Anna Wu from UCLA gave the Keynote Lecture on ImmunoPet probes for profiling tumors and immune responses. This provided also a wonderful opportunity for Tim Steinfatt from the Beilhack lab to rejoin with his former thesis mentor. Prof. Beilhack presented his group’s recent technical advances and latest results of translational research strategies to improve immunotherapy in cancer patients. Travel scholarship and oral presentation to Natarajaswamy Kalleda, and Poster Prize to Dr. Jorge Amich. Outstanding Young Investigator Award at the Human Fungal Pathogen to Dr. Jorge Amich, presented by Eukaryotic Cell. 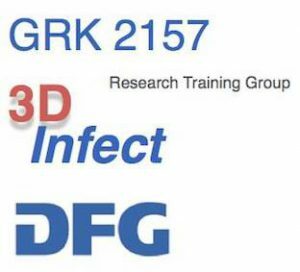 The interview days to select the best candidates for the new PhD research training group “3D Infect” take place in Würzburg. 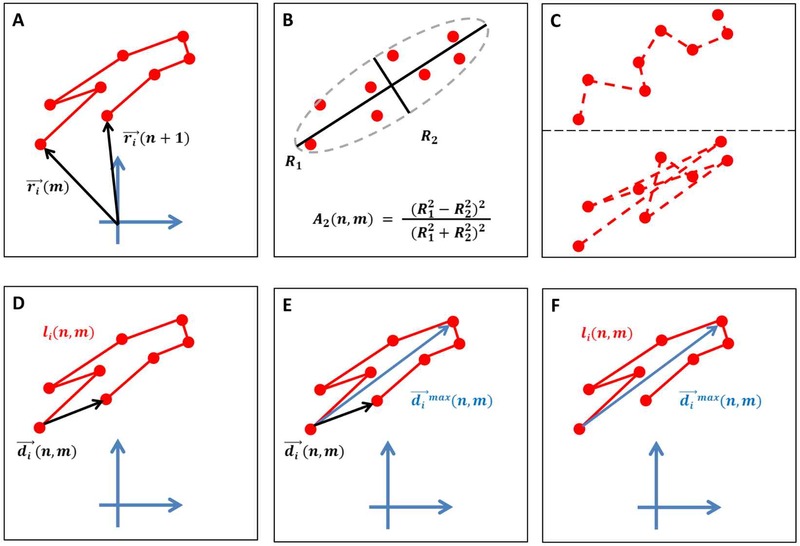 Within this project scientists from different disciplines take a novel route to investigate microbial infections under close-to-natural conditions. Congratulations to a new Dr. med.! Agnes Birner has successfully defended her medical thesis about pathomechanisms in acute GvHD. Congratulations Dr. Birner on your accomplishments! We are very proud of you! The Beilhack Lab welcomes Kerstin Sarter Zaiss, PhD. Kerstin graduated from University Erlangen-Nuremberg, Germany, where she completed her thesis work on Galectins at the Institute of Clinical Immunology. After postdoctoral training in Erlangen she moved to the Department of Pathology and Immunology at University of Geneva Medical School, Switzerland. Kerstin is an expert in preclinical mouse models and clinical immunology. Zaiss et al. (2016). J Exp Med. 213(2):177-187. The Beilhack Lab welcomes Zeinab Mokhtari, PhD. Zeinab graduated from the distinguished research group of Prof. Marc Thilo Figge at Friedrich-Schiller-University Jena, Germany. She has a strong background in applied systems biology and is an expert on the quantitative analysis of migrating and interacting immune cells from image data. 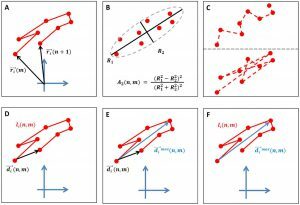 Mokhtari et al. (2014). PLoS ONE 9(12): e115158. 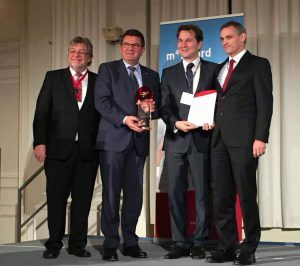 Prof. Andreas Beilhack and Prof. Harald Wajant are winners of the 2015 m4 Award 2015 of the Bavarian Ministry of Economic Affairs and Media, Energy and Technology. Dr. Jorge Amich has been awarded with an MRC Career Development Award of the Medical Research Council, UK. Stefanie Schwinn was selected from 300 applicants for a “Medical Excellence Scholarship” of the Manfred Lautenschläger-Stiftung, which will support her brain cancer research. Natarajaswamy Kalleda had been selected for an inner circle poster award at the 4th European Congress of Immunology (ECI 2015), September 6 – 9th, 2015 in Vienna, Austria. 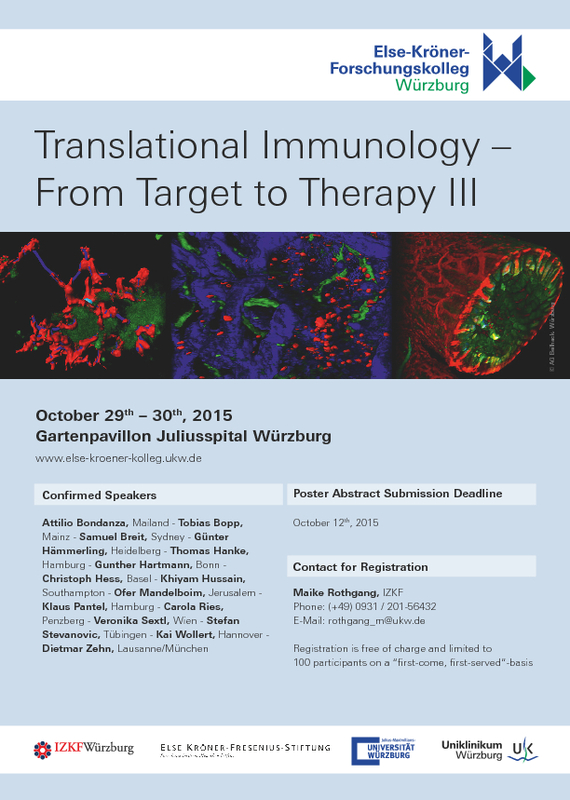 Dr. Ana-Laura Jordán Garrote has received the 2015 Else-Kröner Poster Award for Translational Immunology. Prof. Harald Wajant and Prof. Andreas Beilhack have received the m4-Award of the Bavarian Ministry of Economic Affairs and Media, Energy and Technology at the Munich Residenz. 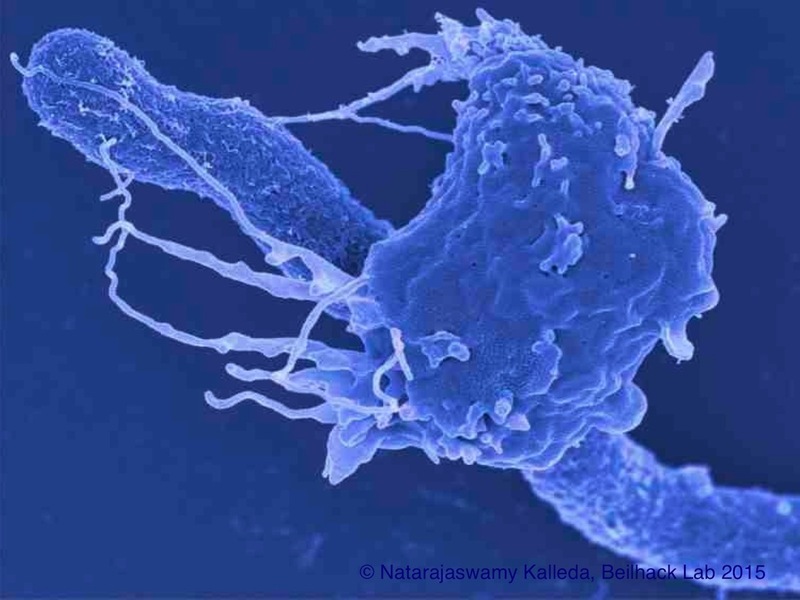 With this award the team aims to develop new drugs to unleash the body’s own immune defense against cancer. Nobel Laureate Prof. Harald zur Hausen presented his latest research on intestinal cancer. 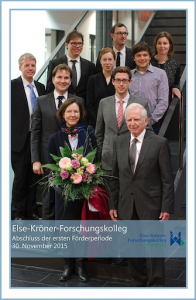 Together with Dr. Susanne Schultz-Hector from the Else Kröner-Fresenius-Stiftung he awarded the diplomas to the Else-Kröner-Fellows of Würzburg’s clinician-scientist training program, the Else-Kröner-Forschungskolleg for Interdisciplinary Translational Medicine. Prof. Jörg Wischhusen, speaker of our Else-Kröner-Forschungskolleg, provided musical highlights on the piano with pieces from Rachmaninoff and Albéniz to close the ceremony. 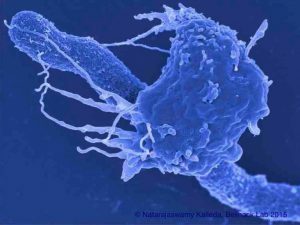 Leaders in the field of immunotherapy presented their recent scientific and clinical advances at the Else-Kröner-Symposium “Translational Immunology – From Target to Therapy”. 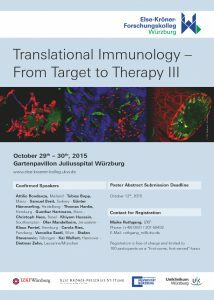 The meeting from October 29-30, 2015 provided again an excellent opportunity for young scientists to present and discuss their own research with international experts in the fields of cancer immunotherapy, inflammation, autoimmune and infectious diseases. Our conference was generously supported by the Else Kröner-Fresenius-Stiftung and took place in the beautiful historical venue of the Juliusspital in Würzburg, where Rudolf Virchow laid important foundations for modern pathology.